Your source for apartment ratings and reviews. Discover apartments by searching RentItOrNot.com. Search city, street or neighbourhood. Once you find an apartment in an area that you like, read the apartment reviews. You can rent with confidence after reading the reviews and becoming more informed. Writing a review is easy and only takes a minute! Start by finding your apartment. Search by address, street, city, or neighbourhood. Once you find your apartment, enter some stars and if you want, write a comment. Sharing your rental experiences can mean a world of difference to renters looking for a great place to live. Bed bugs are a growing problem in North America. Today, they can be found in just about every major city. In the past year, nearly all pest professionals have treated a bed bug infestation. Recent surveys show that apartments and condominiums are on the list of top three places where bed bugs are most commonly found. The RentItOrNot.com bed bug meter allows tenants to quickly indicate if they have found bed bugs in their apartment or condominium. 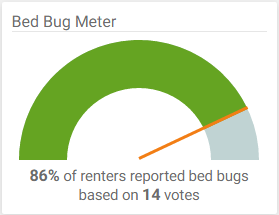 The visual gauge lets you see what percent of the overall tenants have reported finding bed bugs. The higher the percent, the more likely it's an issue in that building. We've taken all our bed bug meter data and used that to create a bed bug heatmap on our search results page. With this, you can easily view the hot-spots in your city or neighbourhood. To help create an accurate map of bed bug infestations, please search for your apartment and cast your vote. Every Yes and No vote helps other tenants in their search for a bed bug free place to live. As a University student, you have your share of challenges. From full course loads to all night study sessions. Make sure that you have a comfortable, quiet, and stress free environment to live and study in. It's super easy to find apartments around your University; simply enter the name of your school and search. Finding the right apartment is important so read the reviews on RentItOrNot.com. Have a question, suggestion or an issue to report? We want to make sure that RentItOrNot.com works for both renters and property managers. Please contact us with your suggestions so we can make RentItOrNot.com the best it can be!